The late Stan Lee was best known to casual fans for his movie and TV cameos. Every True Believer knew where they can find Stan the Man in everything from Agents of S.H.I.E.L.D. to Spider-Man: Homecoming. Lee’s cameos were a Marvel signature across all media, but very few focus on his video game cameos. Marvel’s push into into video games began in the early ’80s with Spider-Man for the Atari 2600. The video game medium eventually gave Lee new opportunities for cameos. Insomniac’s recently released Spider-Man game for the PS4 may have been Lee’s final video game cameo, but it was far from his only one. Now, we’re taking a look back at Lee’s entire history of video game cameos, which goes back almost two decades. Spider-Man, Spider-Man: Enter Electro, and Spider-Man: Shattered Dimensions. Lee narrated the first Spider-Man Playstation game. Released in 2000, Spider-Man PS1 focused on some of Spidey’s most iconic villains and allies. The first game stars Spider-Man and featured Black Cat, Punisher, and Daredevil as well as Venom, Doctor Octopus, and Carnage. Lee returned for the sequel, Spider-Man: Enter Electro. As implied by the title, Electro was Spidey’s primary villain in the game, but the Lizard also had a big role. In 2010, Lee also narrated the Spider-Man: Shattered Dimensions video game. That title featured multiple Spider-Men including Spider-Man Noir, Spider-Man 2099, and Ultimate Spider-Man to stop Mysterio. Lee made his first onscreen video game appearance in Marvel Ultimate Alliance 2. The game adapts the Civil War comic, which dealt with the Superhero Registration Act. After innocent civilians were killed during a superhuman battle, the government tried to bring superheroes under their control. Lee appeared as Senator Lieber, a New York State senator who is rescued by the two groups of heroes and villains. Lieber has several fun interactions with the characters offering Marvel fans several interesting Easter Eggs. The Avengers: Origins, Avengers Origins: Assemble. Lee narrated both The Avengers: Origins and Avengers Origins: Assemble, which were released by Disney on the iPad, iPhone and iPod touch. The app told the story of the Avengers prior to the release of the first film. The story begins with the Avengers looking for a missing Hulk. Thanks to Captain America’s help they succeed, with a little help from the kids playing the game. These apps focused on simple stories for fans just getting introduced to the Marvel universe. At the heart of all of Marvel’s work was it’s primary audience. Lee understood that everyone could relate to the stories he told, but it was important to focus on the kids. Originally released as a tie-in to Sony’s The Amazing Spider-Man, Lee is a playable character, who has powers similar to Spider-Man’s. He engages in several situations similar to Spider-Man’s in order to hunt down pieces of a manuscript that he lost in Manhattan. Lee’s story is once again peppered with Easter Eggs and one liners. The whole thing is perfect for the king of cameos. Lee also plays a character in the main story mode. Peter answers his phone on the way to Doctor Connors’s lab. Lee’s character asked him about charges on his credit card. 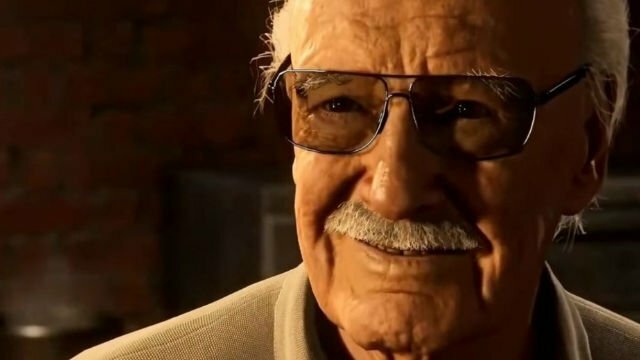 Fans could once again play as Stan Lee in LEGO Marvel Superheroes. As Stan Lee, players could shoot webs and turn into “Stan-Hulk,” while also going up against Marvel heroes and villains. As Stan-Hulk, Lee teams up with the Fantastic Four to battle Red Hulk. Much like the real Hulk, Stan-Hulk can run through the city and cause unbelievable amounts of damage. It’s pure fun and a must for any fan of Marvel video games. This also called back to one Lee’s memorable cameo on The Simpsons. After declaring “I am the Hulk,” and attempting to transform, Comic Book Guy led Lee back to his store. Thanks to LEGO Marvel Superheroes, Lee finally Hulked out. Lee returned to the LEGO universe with even more powers. In LEGO Marvel’s Avengers, Lee’s “Stan-Hulk” was back, but the game also allowed him to become “Iron Stan,” and the Stan-Buster. He was able to cause plenty of positive mayhem. In LEGO Marvel Superheroes 2, Lee’s powers were increased exponentially. Lee had the powers of Thor and Galactus, and he was also able to complete Gwenpool missions. Lee even got a rematch with the Red Hulk. Additionally, Lee could collect missions from Nick Fury like a real S.H.I.E.L.D. agent. What’s your favorite Stan Lee video game cameo? Share them with us in the comments below!